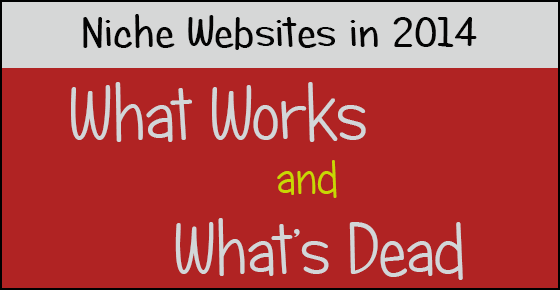 Niche Websites – What Works & What’s Dead! Let’s not fool ourselves here, ladies and gents. The Internet has DRASTICALLY changed since I started. Long gone are the days where you could buy a keyword-rich domain, stuff the site with keyword-focused content and rank for your desired phrase in 2 weeks through article marketing and other kind of submissions that Google now frowns upon. Does that mean people can no longer manipulate the engines and rank quickly? No, it doesn’t mean that at all. Hmmm…. now how did this one-year-old domain end up ranking for such a competitive phrase with hardly any social signals or significant links? Yes, ladies and gents black hat SEO (search engine optimization) still works. Maybe not as well as before, but yes, it works. In case you don’t know, black hat strategies are ones that use manipulative techniques to rank or gain links that are against Google’s guidelines. I have no experience with that kind of SEO and also no interest in gaining any. And I can’t/won’t teach things I don’t know about. I think the biggest difference from when I started is that you NEED a clear cut strategy from the beginning instead of just throwing spaghetti at a wall and hoping it sticks. Not to say strategies haven’t always been important, but when ranking in Google was easier, it wasn’t quite the necessity it is today. Why? Because you could really just focus on creating keyword-rich content and would eventually get enough traffic from Google to make a nice profit on AdSense, affiliate marketing, etc. Try that strategy today and you’ll just end up spinning your wheels with little to show for it. And even if you do get some traffic, you’ll ultimately be hanging on to hope that Google doesn’t drop your site like a sack of potatoes with the next algorithm update. Have you typed in “weight loss tips” in Google recently? The results look so different than they did 5 years ago. 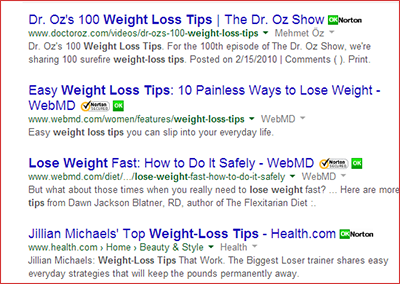 Today you’ll see websites like DoctorOz.com, WebMD.com, and Health.com ranking in the top 10. In other words, BIG BRANDS. Not to be a Debbie Downer but competing with top brands is a tough task. And I still believe too many of you are trying to tackle broad topics instead of a true niche. 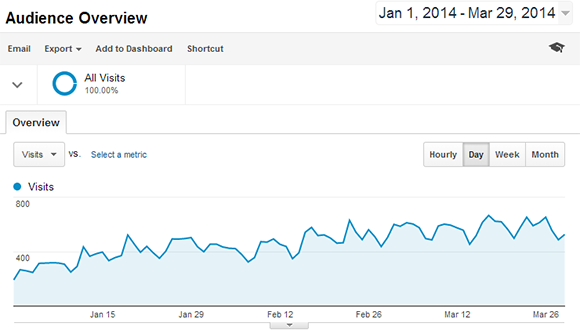 I’m not saying you should rely on Google, but let’s face it… it’s still a good place to get some starter traffic. The key is to diversify with social media, podcasting, YouTube, etc. and not rely on one source. Remember a niche website focuses on a specific group of people. So instead of weight loss (which is a broad topic, not a niche), you might create a site on weight loss tips after gastric bypass surgery. Now, let me make one thing very, very clear. This website you’re reading now is NOT a niche site. It has never been. I talk about so many different competitive topics (AdSense, making money online, YouTube, etc.) I got away with that because I started early and I would not suggest most people do it this way today. That’s exactly why it was time for a current experiment. 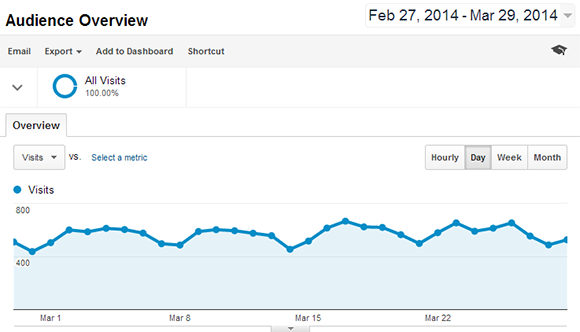 I had to see just how hard it is to rank a niche site today to get some starter traffic. And let me tell you, it is harder, but not impossible. If you are on my email list (not my old Feedburner list that delivers these posts on Tuesdays), you should have already received my free eBook on my latest, anonymous experiment I started in July, 2013. In the book I explain why I didn’t associate the site with my name, online accounts, etc. I wanted to see how hard it was to rank without any benefit from my own name, links, and Google Authorship tied to it. Here’s a snapshot of the recent traffic (the site has around 30 pages). Here’s the traffic trend from the start of the year. Looks great right? Well, you’re about to find out why I’m not excited about this site. For the first time, I did a little bit of keyword research with Long Tail Pro (affiliate link) before I started, and I also chose a topic that didn’t have a lot of other sites that expanded on the topic. Now let’s talk about keyword research. Do you need software to rank? Nah, you don’t, but it’s nice to have if you have it in the budget. Look at it as a luxury. And let’s also not forget that a little bit of physical research and common sense also goes a long way. For example, if you are trying to rank for some keyword phrases to jump-start your traffic and you see nothing but big brands in the top 10, it’s going to be tough. You don’t need a keyword research tool to tell you that. Just go to Google and see for yourself. So that’s where the common sense comes in. But I did use the software to analyze how strong some of the top 10 ranked sites were in terms of their backlink profiles. In other words, would I be able to outrank them without a lot of backlinks? ‘Cause you know me! I’m not one for chasing links. So I personally found a bit of value in that area, but I’m glad I bought the one-time fee version instead of the PRO, which has a recurring payment. The basic one was enough for me. Now, before you become too impressed with my experiment’s traffic results, I can’t say I’m all that stoked about the site because I discovered it’s not really a topic I’m passionate about. I’ve only added 3 or 4 articles since the beginning of the year. There’s no way I can see myself turning this into a long-term site that I’ll be updating years from now. Looking back, I think I was more motivated by the challenge of ranking a new site than I was GROWING a site. So it satisfied my own curiosity. You may remember I was going to sell it after a few months, but when I saw the traffic boost after the Google Hummingbird update in September, I decided to stick with it. And now that I’m ranked on the first page of Google for my main keyword I feel like “mission accomplished.” Sure, I could outsource content at this point and I may just do that, but that’s not typically how I roll. I haven’t decided if I will announce and sell it or just keep it and monetize. It will depend on how much it earns, so time will tell. If you’re just looking for a couple hundred bucks in passive income that you aren’t depending on, then yes, you can still get worthwhile traffic to a niche site from Google. I definitely think it’s possible with some luck and research. It’s crucial you select a NICHE and not a broad or competitive topic. Just remember, if you don’t diversify your traffic, your site’s fate will always lie in the hands of Google. If you’re OK with that, then go for it. But if you want long-term success, you should aim to create an AUTHORITY niche website. This is a website that you are consistently building and adding on to. You aren’t just relying on Google, but you are doing things like regular podcasting, creating YouTube videos, building a list, forum, etc. And because so much more work is required to build traffic to a website today, I think it’s more important that you pick something that you are really interested in. Otherwise you’ll get bored like me with this experiment. I still don’t think enough people are looking at niche websites as long-term projects. They are waiting on Google to rank them and hope to passively roll in the dough forever. Niche websites will never die because people will continue to go online and search for information on how to do [whatever]. But the old SEO methods we relied on are dead (or dying), so it’s super duper important that you iron out a strategy that doesn’t just involve ranking on Google. Say you have a site that helps people plan a reception for under $X,000. This is an example of a very niche site. It only focuses on the reception part of the wedding and you know that your audience is on a very tight budget and seeking any kind of cost savings they can find. Your ultimate goal to build traffic for your wedding planning/consulting business. You set a schedule for YouTube and decide to publish videos Mondays and Fridays to build up momentum. Momentum is super important on YouTube, especially in the early days of building a new channel. You’ve got to get people used to seeing you — especially today when they are subscribed to 200 channels that are constantly competing for their attention. Start off with a schedule. On Mondays you publish videos on DIY decorations. On Fridays you do videos on budgeting. Then as your channel grows you may even add a 3rd day where you do Q&A. One of the biggest reasons people never get anywhere is they don’t establish a rhythm and give up too soon. And this doesn’t just happen on YouTube, but blogging as well. How many of you have ever tried YouTube but got discouraged because no one watched your first few videos? You can’t just give up after a few attempts. Also remember, the Internet is fiercely competitive now. This is not 2007. People have shorter attention spans and a different standard for quality with both content and video. Just look at how the production of YouTube videos has improved over the years. Someone emailed me recently and didn’t understand why no one was subscribing to his channel. To be honest, it looked like he was recording his videos with a calculator! 🙁 The quality of your videos make more of a difference than you may realize. And don’t forget to target the right keywords. Do videos on keywords and topics people are actually searching for. This is easy to find. Just start typing keywords in your niche into the YouTube search box and the auto fill will tell you what is most popular. This next tip is super important. Look and see if there are a lot of popular videos on these topics/keywords. If there are, take notes on why you think these videos are popular. Is it the presentation? The vloggers personality? The earth-shattering information? Are they using humor? Was it a clever or fun use of animation? Is it a combination of all the above? Figure out what is making their channels tick and aim to be better! Just remember, the key to ranking and drawing traffic on YouTube is getting “likes”, shares and comments. Engagement largely determines where you rank and how many subscribers you gain because YouTube will suggest your videos to others on the homepage and right column. That’s how I get most of my subscribers…. not from promoting my channel on my sites. Now you can use your videos to build your email list that is attached to your blog updates (easy to do with AWeber’s [affiliate link] Blog Broadcast feature). Encourage your viewers to subscribe by clicking a link in the description that takes them to a subscription page. I’ve actually started doing that myself. Or you can use clickable Annotations and link to a subscribe page on your site. See the video below. My email list is one of my most important assets, and since it’s tied to this blog, I now link to my subscription page in the video description instead of my homepage. This is what made sense for ME. Obviously you need to do what makes sense for YOU. My point is, in 2014 you need to have a strategy for how you’re going to build up a following, develop a rhythm and you must, must, must stick with it for months. A lot of you are giving up way too soon and it definitely takes time. So what if you fail? Figure out what’s broken, fix it and keep going! I fail all the time and I’m not afraid to admit it. It’s part of life! Rome wasn’t built in a day, and neither are website businesses – ESPECIALLY in 2014! I still believe too many people think this is some kind of calculated step by step process. While there are certain steps you need to follow (like choosing a topic, building a site etc. ), it’s more of a journey and yours may look completely different than someone else’s. Is it harder today? Yes! But definitely still doable with a plan, strategy AND the right expectations. Read more about what Google looks for when ranking websites. Are You a Robotic Webmaster? Hey you have written a detailed post about niche site, I think that the safer way is to not choose EMD for you niche sites and this takes away the risk of google penality. But putting keyword in your post is most important which help google rank you higher in SEO. Keyword is one of the way which attracts loads of traffic. I’m sorry I’m late to the party. I just read this. Anyway, recently I have been invited on a 30-Day Video Blogger Challenge; I started late on this and so I won’t get to do 30-videos. I’d be lucky if I can even do 8 before it’s over April 11th. Niche sites work better than other mega sites,i have done experiment on it as selecting “music” and if there is low competition,your niche sites performs well. You could always outsource your niche site too, if you don’t enjoy doing it anymore. However, it would take a while to find a replacement and the cost of outsourcing could be expensive too. Exactly. I think it’s natural to think that if you have a broader site, you have more potential visitors. But you are opening up the competition too wide, making it impossible to get traffic today. Thanks for reading, Lise! My blog has a health niche. My post contains all about health. no exception. Is the health niche is too broad? Or do I have to choose a specific niche like men’s health or women’s health? Are niche general health have enough prospects in the success of a blog? I think so. Today you need to narrow it more. So instead of health maybe do something like heart attack prevention tips or something very specific. This is good to know, I’ve wanted to create a health website as well. I’m new to internet marketing so by the time I have a website come out it will be 2015. I would much rather create a health website instead of website about toe nail fungus overgrowth lol or something ridiculous like that…since I’m new to internet marketing I’m still not completely getting why creating a niche site would help you rank any better than a regular site. For example lets say I create a website called health.com-then create ten articles about heart health for 50 years olds and use long tail keywords for those articles, why wouldn’t they rank just as well as if I created a site called hearthealthfor50yearsolds.com and then created the exact same articles? So what you’re saying is the niche site would rank but the health site wouldn’t for the same articles? Can you elaborate on that please? But that’s just it, if you created a site and called it health.com and targeted 50 year olds, you ARE creating a niche site. The only difference is the name and that’s not going to make much of a difference today. What makes it niche is your actual content. So whether you call it healthfor50yearolds.com or health.com the content is still targeting 50 year olds — thus making it a niche site. There was a lot to learn from the Post but the most important thing I learnt today is having a rhythm and don’t give up. My blog is fairly new and I was about to give up but now I am going to establish a rhythm and continue blogging with a rhythm with at least 2 posts a week no matter what, for the rest of the year. I will come back with stats if something changes after establishing a rhythm. Wow!!! Lisa – do you think the approach for the Niche websites should be different for different countries? Again, Google tends to personalize search results when I try looking for keywords from my end, it will be different from your end. But the keyword tools like the Google Keyword Planner will let you choose what country. So when you do research you can see the average searches based on the country. You didn’t receive the “thank you” email after you confirmed your subscription? Did you get the confirmation after you subscribed? Check your junk folder. After you enter your email you have to confirm the subscription. Sometimes that message goes to “spam.” Then once you confirm, you’ll get another email with the ebook. sell your products to them. I appreciate your post, very helpful. Thanks for sharing. Hi Lisa, its my 1st time here..I start to following your blog to learn about blogging..thanks its very informative. Interesting read, as always. Do you have any comparitive data or observations on the relative merits of niche sites vs. building niche content on a more generic site ? Say for example you identified ‘100% natural human hair extensions’ as your niche, or ‘gastric bands afte weight loss surgery’ using your example above. What would be the merits / pitfalls of targeting this term as part of a wider site vs. developing a niche site ? I guess my point is this: ranking for these long tail phrases should be possible due to their uniqueness but the real issue is building traffic for more generic terms, ones that see large volumes of traffic. How do you link the two ? I’ll give you an example: I recently wrote a blog on using ‘BuitWith’ It currently sits at c. position 30 in the SERPS with little effort on my part but it isn’t going to drive targeted traffic to my site because it’s simply not a lead generator for my business. Rather, I wrote the blog because it was of interest to me and I thought it would be of interest to some retailers looking to navigate their way through the myriad eCommerce options out there. I think it really depends on how competitive the broader topic is. For example, natural hair is not nearly as competitive as website building, so I’ve found myself ranking well for other related keywords that may be more niche. So it really depends on the bigger picture. Yes, it certainly pays to do your homework to establish the level of competition before embarking on any attempt to build an online profile, whatever you do. But, as you said, the most important thing is to concentrate on something you get personal satisfaction from or enjoy. I wouldn’t say SEO is dead (that’s just a soundbite) but I’m seeing it as far less important. Becoming an ‘Authority’ is far more a factor if you want to be found by the search engines. But I guess Google have been telling us that for a while. You nailed it. I would much rather be an Authority than someone constantly trying to keep up with search. It will drive you nuts. SEO isn’t dead. It’s just changed and is now tied to authority and selective backlinks more than ever before. Glad I ran into you via Angela McCall on Google+ Your post is fantastic! Yes, gone are the SEO days, and I’m sure glad because some of those blogs overused the SEO and were intelligible to read. I don’t have a niche site, but blog consistently. I was always a fan of social media and am pretty active on it. Put this all together and I think I’m pleasing Mr. Google these days lol. What I found most interesting is your advice on Youtube. You have given me much to think about and I appreciate it! Great write and I think you nailed it. Google looking for freshness and giving them that (and you spotted a winner). Of course, niche sites aren’t dying but they just get tougher to rank. Seriously. Anyway, great great write and keep it up! Anyhoo, I have a question. When you said, you now link to you “subscription page” in the video description instead of your homepage. You mean, everytime you create a video you include your blog page, right? Also, I believe I’m on your email list, but I don’t remember getting your eBook regarding your atest, anonymous experiment I started in July, 2013. How can I get this? Yes, I link to my subscription page on this blog that has an email sign up form. In my last video I actually used the Clickable Annotation feature to link to that page. There are many niche blogs which are on a particular niche. Some thinks that these kinds of blogs can’t get good response from SEO but I totally agree with the point as millions of people are uniting to the internet and there is no need to panic for the niche blog holders. From earlier days of blogging SEO methods have changed for which we need to learn about. If any blogger wants to set up a blog at a particular niche will interests him/her then there is no need to think about these kind of rumors. Every blogger should work hard to get success. Internet will be keep growing at a fast rate. You are right, the game has certainly changed from when I first got into it back in early 2001. I’ve seen articles and forums posts from people (ShoeMoney posted an example on his blog) who believe that you can still make a lot of money with niche sites following the EXACT same steps that we used to. But then he is promoting a keyword finder tool in it, so maybe it is a ploy to get people to buy it. A couple of years ago I registered a number of domains in various niches and I’ve started working on them again by writing articles and I’m looking to outsource some content to HireWriters.com. Are you serious? Yeah I stopped following him a long time ago… maybe that’s why. Imagine the disappointment when people discover the real truth. Never heard of HireWriters.com. Gosh, there are so many sites out there now… hard to keep up. My problem in building niche websites is entirely different. I just cannot bring myself to settle on a keyword. My mind has this continuous flow of ideas that it becomes hard to settle on one of them. I hear this a LOT, Patrick. And it’s why people often end up creating multi-topic sites — which I’m not usually a fan of. But your issue is very common. This is something I have also discovered. While I struggle with my how to blog covering many many tech topics, I’ve seen other people narrow down to a single topic. For instance, “browser cookies” and they go ahead and write everything to do with browser cookies. Topical authority is more important than domain authority in this day and age. This is one of complete tutorial I’ve seen for people who plan to build niche web. Good job, Lisa! Lisa, I really enjoyed this post, and I want to say your writing gets better and better. Your use of metaphor and analogy is tight and really on point. It is genuinely entertaining and I feel you are painting a picture in my mind. I appreciate your flair and style, it really speaks to me. Nice post…but I’m curious…so you don’t do any link building at all? And another question…the 30 page authority site you made did you write 30 articles for the site?…and one more question…how long did it take you to build the site…1 day, 2 days, a week…etc? I posted about 3-4 comments on some relevant blogs and that was it. Now I did create a Pinterest account so if you want to count that. I created most of the content in the first month and wrote 90% of it. I did outsource a few articles. You know what makes you refreshing?…your honesty….I once told Eben Pagan… because people trust you that’s worth more than gold…I would classify you as the same….you create trust through your writing…that’s a gift…I don’t know you from Eve but if I ever met you I would feel as if I did know you…and that’s tough for me because I am a hard sell…I compare you to my favorite basketball player (Michael Jordan) and I live in Chicago so I have seen and heard a lot about Mike it’s as if he lives next door to me…guess what Lisa I have a new neighbor….and her name starts with a L and ends with an A…One final thing….I may not agree with everything you say…buy I damn show trust what you say!! LOL, I’m honored Will. And to be up there on your list with M.J. is another honor. I’m a big fan of his too. I grew up in his era and I miss those days. The game has never been the same since he left. I really dont think I have a passion or hobby enough to create a authority site on, I have tried a few site ideas and always give up due to passion problems. I am a hobbyist I guess but that is way too broad surely. What would you advice or is creating an authroity site just not realistic for everyone. I do think some people need to realize this is not for them, even though that may be a hard pill to swallow. And that has nothing to do with niche websites, that’s life. Just like stock investing isn’t for everyone or playing basketball isn’t for everyone just because someone may want the success a ball player may have. So I would say, find what you ENJOY first and then discover a way to monetize it. You may discover you have this incredible ability to make people laugh. Get on YouTube and make videos and see where it takes you. Start with what is fun for you. For me, it has always been teaching so I make a living teaching but niche websites just happened to be the topic. The key is start with what you love and the money will follow. Not the other way around. Hey Lisa: I agree with you that it is now imperative that anyone building a website needs to start with a solid plan. I think you have always encouraged that. Now, I think that aside from having a strategic plan in place which includes your website and social media activities well mapped out, you need to be prepared for modifications to your plans. Over time we have seen trends change and in order to keep relevant and current a webmaster must be prepared to change with the times. That is why it is so important to keep current with the latest new platforms and social trends. There is no status quo. You are either falling behind or surpassing your competitors. Very, very good point, Ann about being prepared to modify. I think a lot of people try one method, and if that way doesn’t work, well they move on and chalk it up to “this doesn’t work” The Internet Marketing game is so fluid. You have to be willing to adjust as the times change. Great points here! I expected a lot when I saw this on G+ and I have to say Lisa you exceeded my expectations (again). I agree with you that the focus now has to be on specialty niches more than ever and yes competition is extremely fierce just look at the #IBCT it’s crazy. With that said, where there’s a will there’s still a way to stand out. Thanks sharing some great tips AND keeping it 100 peace. Great post Lisa! It’s so reassuring to hear that adding high-quality, niche-focused content in a consistent manner over time (months, not weeks) is (still) the way to go. Here’s a tip I use to save time…I set up a schedule in my calendar where I dedicate one day a week to creating fresh, new content for my site. I then “release” the new stuff over several days. Throughout the rest of the week, I grab and save relevant articles, videos and topic ideas so when it comes time to write, I have plenty of material to work from. (Google alerts are great for this!) This method frees up my time to pursue other projects, study new programs, and still keep my site updated regularly in a super-efficient manner. Would love to hear what others do! Christine, you are so good. I wish I could be that organized! LOL But I think that’s such a great idea and yes, Google alerts are a great way to get ideas and see what people are talking about in your niche. Google Alerts . . sounds an excellent idea for getting fresh ideas, Christine. Will check it out. Like you said, I’ve learned that lack of interest and passion are the top reasons for quitting. By the way, I must have missed that ebook email too! So interesting to hear your sage advice on niche site building. This is something I’ve tried and failed at more times than I care to remember. The fact that you got such promising traffic on your anonymous niche site without the aid of your Google authorship is amazing. Great YouTube advice too. Thank you, Lisa. Thanks so much. Appreciate you taking time to read and comment. Didn’t know you followed Lisa’s blog too. I was watching one of your videos today 🙂 Where in the UK are you from btw? Hi Lisa, great post! I love that you are talking about niches. I think that’s one of the hardest things to do for most entrepreneurs. By niching down, you inevitably feel like you are closing doors whereas it’s actually the opposite you are doing. Great post Lisa. Only thing is I never got that eBook you mention in the beginning of the article. I have read all your books…and even have a dedicated “Lisa” file in Google Docs for them, but didn’t get this. Are you on my list? If not, you’ll get it. If you are, just drop me an email on the contact form here and I’ll send it to you. Yes. I am already subscribed but I get the emails Tuesday. I tried to sign up using the widget on the right hand side of this page (towards the top) but it says I am already subscribed. If you could email a copy of that book it would be appreciated. Sure, no problem. Should I use the email address tied to this post? If not, email me (don’t post it here) the one you want me to use so I send to the right address. Yes use the post address. Thank you for all you do. I’m also one of your long time subscribers. Please send me your ebook. Great post, will be taking a long hard look at my online business. Looks like I’m going to have to subscribe to your email list now Lisa – will I still get the ebook? Seeing as I’ve been a subscriber to this blog for *years* I don’t know why I didn’t subscribe before! 1) It’s easier than ever before to actually build a website thanks to low-cost hosting, CMS like WordPress and plenty of other free tools. 2) This has resulted in more competition online and Google (and Facebook recently) are getting smarter and smarter at sorting “the wheat from the chaff”. That means that despite all the “push button” software I do believe it’s harder to build a successful website these days – with quality content and white-hat promotion strategies being essential to a long-term online asset. Yep you will receive an email to download it right after you confirm your subscription. And you are right. With all the competition and algo changes, it has DRASTICALLY changed the game.